In Japan, You Can Find Hundreds Of Variations Of Which Of These American Candies? In the world of surveying, markers are critically important. Once the work of conducting the survey is complete and the surveyor has packed up their gear to head home, the markers they leave behind become part of a critical record of land ownership, boundaries, and, potentially, part of future legal disputes. While there are a variety of different survey markers used in different contexts (longer spikes to penetrate deeper into the earth, larger heads to be easier to detect, etc. ), the majority of them are purpose-built for the task and start off life, right out of the forge, so to speak, as survey markers. One of the more interesting exceptions to that is the widespread use of discarded parts from cotton pickers. Specifically, the cotton pickers’s spindles. These spindles are metal spikes, approximately five inches long, that feature a textured shaft and a large rounded gear head. In an actual cotton picker, the function of the spindle is to mesh with the machinery in the front of the picker and, as it rumbles through the cotton fields, help capture the cotton and pull it free. The gear turns the spindle while the texture grips the cotton, and the hundreds of spindles working together make short work of cotton harvesting. When those spindles reach the end of their life, however, they don’t end up carted off to the smelter for a complete meltdown and overhaul. Instead, they end up in the hands of surveyors. Years ago, some clever surveyors discovered that the spindles are perfect for surveying work, especially in urban areas where the spike will be sunk into asphalt or concrete. They’re short, strong, already tapered in a spike shape, textured (which helps keep them seated), and the rounded gear head that previously meshed with the cotton picker’s mechanical parts is perfect for visibility, but resistant to damage (from snow plows, for example). Objects that bump against the rounded gear head just slide up and over. On top of all that, they’re magnetic and easy to locate if they get buried. 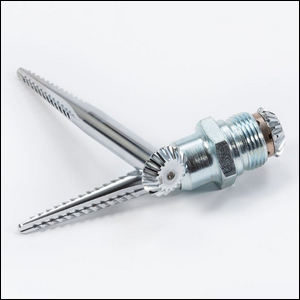 Even though they’re from a cotton picker and not a cotton gin, they’re commonly called “gin spikes”, “cotton gin spindles”, and “cotton spikes”, among surveyors. So if you’re ever walking down a trail in the park or looking down at a parking lot’s surface and see a strange gear-like shape mashed down into the earth, you’ll know exactly what it is—a little telltale sign that surveyors have been at work in the area, quietly mapping out the invisible boundaries around us. Image courtesy of John Deere.